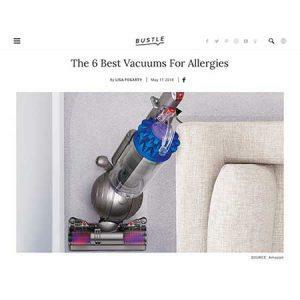 Bustle online magazine has put together a great guide to help people select the best vacuum to defend against allergens accumulating in your home. The Kenmore Upright Vacuum Cleaner, that passed our scientific standards for the Certification Program, was elected “The best asthma & allergy friendly® Certified Vacuum for allergies”. The Dyson Ball Upright Vacuum, that also passed our scientific standards, was elected as “The best expensive, but investment worthy vacuum for allergies”. It may not be cheap, but Dyson fans are familiar with the next-level tech features that set this upright vacuum apart, especially for allergy sufferers. We’re very proud that two out of the four best vacuum cleaners elected by Bustle passed our scientific standards to be certified asthma & allergy friendly®.